Normally, I prefer female protagonists in my reading. But I’ve recently read two books whose main characters (and most of the supporting characters) have been male. Richard Wagamese’s beautiful writing pulled me into Medicine Walk effortlessly. In Found Far and Wide, it is Sam’s story that had me turning the pages. 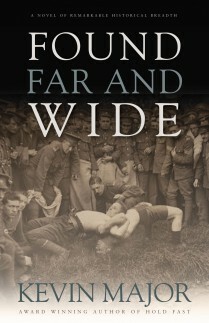 In four parts, Found Far and Wide tells the story of Sam Kennedy from Harbour Main, Newfoundland. His mother died when he was young, leaving her husband, Paddy, to bring up Sam and his younger sister. Paddy is a fisherman, and he expects Sam to join him when the time comes. But, Sam has other ideas. He’s restless, and he’s not happy with the credit system the fishermen are working with for their living. He wants more out of life. A fellow needed to prove himself, on his own, away from his family. The Newfoundland feel, despite the fact that half of the book takes place outside of Newfoundland; WWI and the skyscrapers of New York take Sam away from home for many years. Although a big section of this book is about Sam’s time as a soldier during WWI, this is not a book about the war. This is about Sam’s life and how his experiences and historical events shaped who he was and how his life played out. Sam agreed, when it came to life and death, luck he’d always had. For the most part, this isn’t a funny book, but there are some moments of humour in the book to lighten things up. Sam’s efforts to seduce Mabel in New York made me laugh; the lengths he would go to just for a chance. Sam, sweetheart, you got to work for it. You can’t be licking the cone like it’s Sunday afternoon in the park. You can’t expect to be handed the sweetest fruit you’re ever likely to get in your whole life just by being Sam. Show me Sam with class, Show me Sam with more than fancy new Andrew Jacksons sticking out of his wallet. There’s a lot of history woven into the story of Sam’s life, which was probably what I liked most about this book. Some of the historical events include the Great Newfoundland Sealing Disaster, the Fishermen’s Protective Union and local politics of the time, WWI and the Newfoundland Regiment at Gallipoli, the construction of the Empire State Building, the Depression, the Grenfell Mission in St. Anthony NL, and the Lindbergh’s visit to Cartwright Labrador. Unsurprisingly, Sam’s time as a soldier had a big impact on the rest of his life; for all the obvious reasons, but also there was Emma, Johnny’s fiance. Johnny had shared his photo of her with Sam, and in the terror, tedium, and loneliness of war, Sam found himself longing for a woman he had never met. He continues to think about her through his years in New York, and when he finally decides to go home, he mostly has one thing on his mind; the girl from Johnny’s photo. He wandered several hundred miles by train and coastal boat in anticipation of the moment he set eyes on her. The end of the book leaves much to the reader’s imagination; which is both frustrating and satisfying. I wanted more, but more probably would have ruined it. Sam’s whole life (up until we leave him) feels aimless. At some point in the book, when I wasn’t expecting it, I became invested in Sam and his future; I wanted him to find what he was looking for… whatever that was. This is my first time reading one of Kevin Major‘s books, but he has quite an extensive backlist to explore, including children’s books and non-fiction. *Thank you to Breakwater Books for sending me a copy of this book for review. If you’re an author, it must be difficult to know where to draw the line in a story like this where the focus is on the experiences of a central character. It sounds like the type of book that would be useful to discuss with other readers to hear their take on Sam’s life. Yes, and to discuss what they think is going to happen next in his life. I really thought I knew where and how it would end, but I was wrong! Knowing where to stop must be a tough decision for an author when they’ve invested so much time in creating the character. I do enjoy books however which have an inconclusive ending – it gives me scope to consider that the characters may have a life outside the book and then to imagine what that might be. I would totally be into all that history – I’m sure it would send me down a serious Wikipedia rabbit hole! Given that quote I think I might have liked to hear more from Mabel. Mabel was a fun character, but might have been a bit much had she continued to be in his life. He needs someone less materialistic! Sounds like a book that would be a good one for a buddy read or to discuss. Are you reading a lot of war related books right now? Is this some project? Thanks for the suggestion, Melanie! It does sound good and I’ve added it to the list! Another one that sounds really interesting. I always like when a book takes place around real historical events without necessarily focusing directly on them – it enhances the feeling of place and time, I think. With novels with historical settings, I’ve sometimes found myself complaining if an author doesn’t mention an event that would have been huge to the people involved at the time. I’ve noticed that too, from time to time, and it bothers me also! In this book, he’s even included smaller events that I didn’t know about and looked them up to see if they had really happened – like the Lindberghs’ visit to Labrador. I haven’t really thought about it, but now that you say it, I prefer books with female protagonists as well. I prefer books written by women on most days! Lovely review, Naomi. This book sounds excellent, especially as it’s set right in one of the time periods I love most. I’ve not read anything set in Canada at that time though, so this would be a change for me – definitely adding it to the TBR! I’m sure I’ll be able to find it – Book Depository has everything! You’re right – it seems to be there! I love a well-written historical fiction novel – this one sounds like it was set in a fascinating time period. Lovely review as always, Naomi. Thanks Laila! It was a nice book to sink into for a couple of days.